It was only a few years ago that headlines in Europe and North America were screaming about the coming “bee armageddon”. 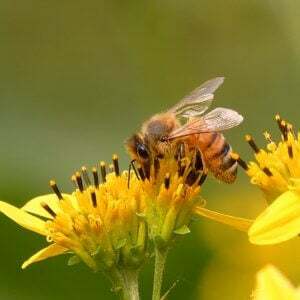 Honeybees were going extinct, we were told, and because these vital pollinators are vital to our food supply, we were on the verge of global starvation. And pesticides were mostly to blame for the crisis. 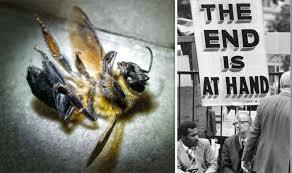 The problem with that thesis was that honeybee populations aren’t declining, let alone headed for extinction. As I’ll explain below, the media have finally updated their doomsday reporting (years behind the Genetic Literacy Project, which has been documenting the faux crisis for years). However, no sooner does one apocalypse slip from the headlines than another springs up to take its place. 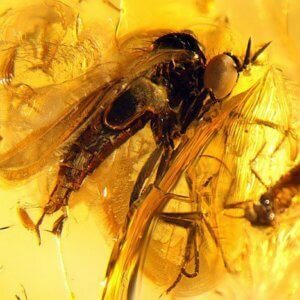 Recently, news and advocacy groups sites have been afire with dire warnings that man’s days on earth are (once again) numbered, this time due to the accelerating extinction of all of the world’s insects. More on the impending insect crisis below. later. But let’s first review the botched narrative also known as the “bee-pocalypse.” Yes, bees do face some health challenges as the result of a variety of factors, most prominently their loss of habitat and the explosive growth of their mortal enemy, the Varroa mite. But balanced analysis by independent scientists put the use of pesticides way down on the list of pollinator threats. Even some advocacy groups finally abandoned the crisis rhetoric. 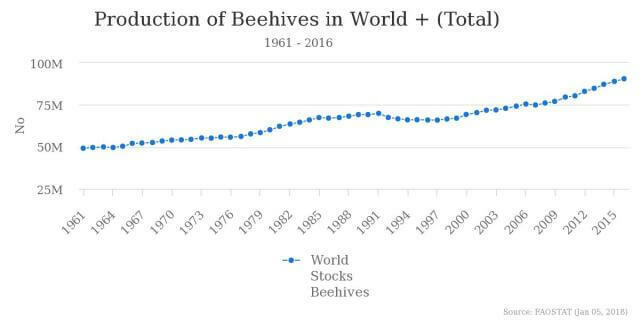 While diseases, parasites and other threats are real problems for beekeepers, the total number of managed honeybees worldwide has risen 45% over the last half century. We’ve told that story many times in the Genetic Literacy Project. [GLP has an entire section on pollinators health here] You can see charts of the honeybee hive increases in the United States, Canada, Europe and elsewhere here. 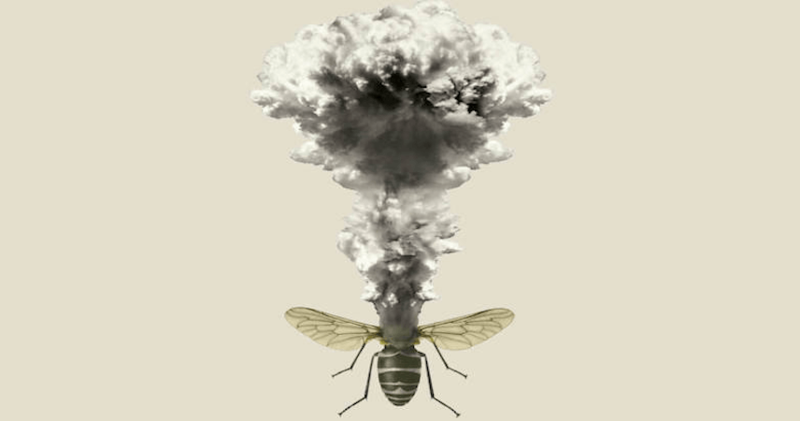 The “bee-pocalypse” was an exaggerated fiction grounded in genuine concerns about the planet’s ecological health. It was pushed by anti-pesticide activists, aided by a credulous, supplicant media, as part of an attack on modern agriculture and the ideological belief that ‘big ag’ was pushing a biotech-chemical agenda. Its direct impact was to throw a cloud over a new class of pesticides known as neonicotinoids that are actually a dramatic improvement over the ecologically dangerous, cancer-causing chemicals that they replaced. The sensationalist-oriented media did not check the facts. The mountain of misinformation was subsequently embraced by many politicians eager to demonstrate their environmentalist bonafides. 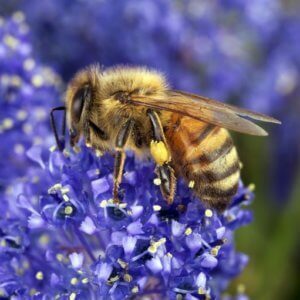 Suddenly, over the past few months, the focus abruptly shifted from honeybees or wild bees to insects. The Guardian in the UK led escalated the concern to worldwide panic with a February article warning, Plummeting insect numbers ‘threaten collapse of nature’. Within days, numerous media and environmental advocacy outlets jumped on the story, all of them. What was the source? One study, which more accurately was a selective “review” of other studies, conducted by two scientists, one from Australia and one from China. It was remarkable for a number of reasons, not the because of the decidedly un-academic, almost hysteria-like tone, of its authors. If insect species losses cannot be halted, this will have catastrophic consequences for both the planet’s ecosystems and for the survival of mankind,” explained the study’s lead author, Francisco Sánchez-Bayo, of the University of Sydney, Australia. The rate of loss – 2.5 percent a year according to his calculations – is very rapid, he said. “In 10 years you will have a quarter less, in 50 years only half left and in 100 years you will have none. We aimed at compiling all long-term insect surveys conducted over the past 40 years that are available through global peer-reviewed literature databases. To that effect we performed a search on the online Web of Science database using the keywords [insect*] AND [declin*] AND [survey], which resulted in a total of 653 publications. Reflect on this for a moment. The researchers ostensible purpose was to survey the scientific literature on the state of insect populations around the world. But the words they used as search terms suggest a distinct bias in how they framed the question. The authors limited their review from the get-go to only those papers that reported a decline. Any paper that found stability or even increases in insect populations was likely to be eliminated by this Boolean search. But that is only the beginning of the concerns raised about this paper. As others have pointed out, although the authors claimed to do a “worldwide” assessment, the data they used was almost exclusively gathered from North America (primarily the US) and Europe. 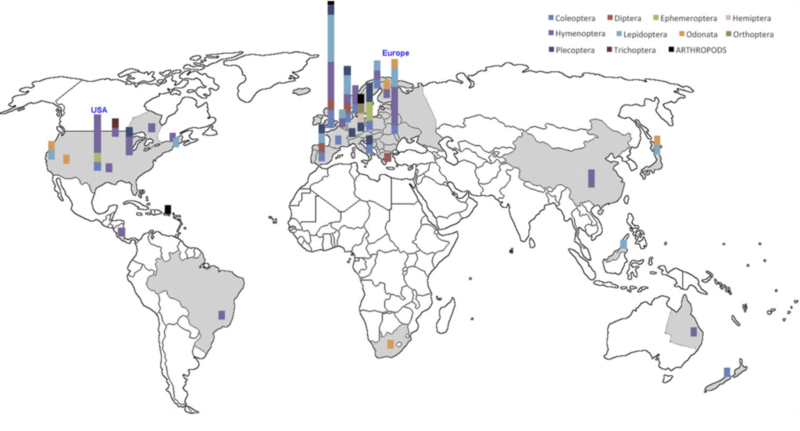 Geographic location of the 73 reports studied on the world map. Columns show the relative proportion of surveys for each taxa as indicated by different colours in the legend. Data for China and Queensland (Australia) refer to managed honeybees only. The only data from Asia, apart from Japan, were studies of managed honeybees and not the general insect population. The same holds for Australia. And there is no data at all from equatorial Africa and almost none from the vast continent of (insect-filled!) South America. Assessing trends in worldwide insect species while largely ignoring the Amazon and other equatorial regions simply doesn’t make sense. It’s estimated that some 30 million insect species inhabit the tropical forests of the world, compared to 91,000 in, say, the US, where a disproportionate number of these studies originate. But it’s not just what’s missing. Focusing on northern latitudes is likely to skew results in other ways as well. Insect populations at northern and southern latitudes are subject to dramatic changes due to fluctuations in weather from year to year (even short of gradual overall warming due to climate change). Species on the edge of their range may spread northward during warmer years and snap back again due to a particularly cold winter. This hardly represents meaningful species loss, however. Which brings us to the many unknowns concerning this paper. A review such as this is critically dependent on the judgement by the authors, not only on which studies to include (in this case, as we’ve seen, only studies headlining a “decline”) but also on how to interpret and analyze those studies. And here again, there is reason to question. While the paper examines many reasons for insect declines, Sanchez-Bayo tellingly has largely emphasized the role of pesticides in his media interviews. The stepping far outside his area of expertise, and discoursing on issues not covered in the study, he repeatedly has called for a switch from conventional to organic farming. He is apparently ignorant of the fact that organic farmers use large amounts of “natural” pesticides, some of which are highly toxic to insects. Sanchez-Bayo consistently seems to go far beyond the data he and his co-author collected. Let’s take a look at Figure 6. 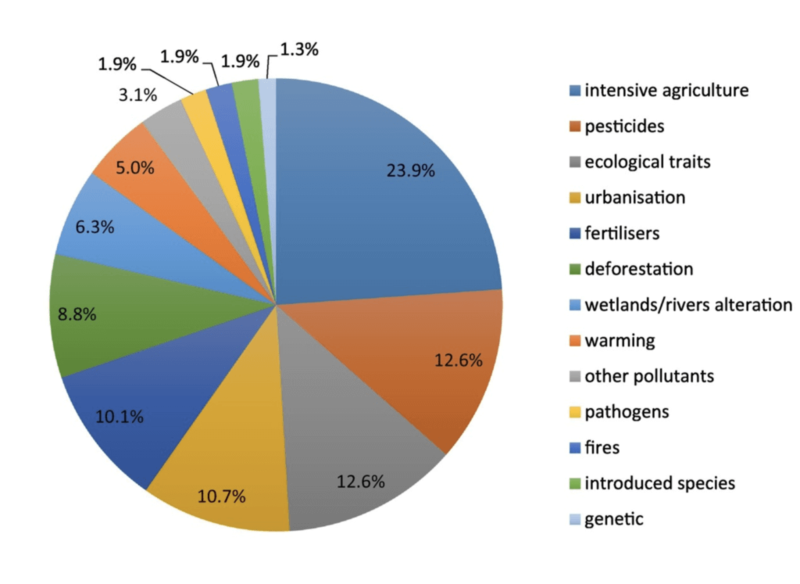 According to this pie chart, pesticides (represented in burnt orange) are identified as a main factor in only 12.6 percent of the reports reviewed. That, of course, leaves 87.4 percent are other factors. It also begs the question of what this number actually represents. Is it indicative of how large a problem pesticides are, or is it, as more likely, a measure of how intensively pesticides have been studied in comparison to, say urbanization, the destruction of wetlands, clearing of forests, invasive species and pathogens—issues that most experts in the field believe have had the most impact on insect populations. Still, assuming the 12.6 percent is a meaningful number, it’s not clear how the authors arrived at it. Table S2, for instance, identifies each of the 73 papers in the review together with the “main drivers” of insect declines identified in those studies. Of the 20 that identify pesticides, 17 also report other drivers acting at the same time, including climate change, disease, habitat destruction and other pollutants. How does one tease apart all these many factors, often acting in parallel, to separate out pesticides? The authors provide no guidance, almost certainly because they did not dissect the data appropriately. The reasons for declines in the North American fauna over the past few decades are not well understood but likely include multiple stressors such as pathogen spillover from commercial colonies, pesticide use and habitat loss. Several multivariate and correlative statistical analyses conﬁrm that the impact of pesticides on biodiversity is larger than that of other intensive agriculture practices (Fuentes-Montemayor et al., 2011; Gibbs et al., 2009; Mineau and Whiteside, 2013). Unexpectedly, bat activity levels were generally lower on farms involved in AES than on conventionally-managed farms, in accordance with patterns of prey abundance. …. [O]verall insect abundance (not including Lepidoptera) was almost twice as high on conventional farms compared to AES farms. Somehow, however, this finding that insect populations on conventional farms were abundant was twisted by in the Sanchez-Bayo paper to claim the very opposite of what the original authors had found. Just last week, one of the most respected scientists studying species extinctions, Clive Hambler of Oxford University, examined the Sanchez-Bayo paper and two other recent papers on insect decline that fueled the recent wave of media hysteria, finding them woefully deficient. He has submitted a critique to the journal ‘Biological Conservation’, which published the Sanchez-Bayo paper. We are awaiting its publication, but the article in ‘working’ form is available online for crowd review. It notes the unrepresentative samples used by Sanchez-Bayo, the absurd skewing of the papers studied due to the selective search terms employed, major analytical flaws and the misuse of IUCN “red lists,” which often denote regional declines of species that might be abundant and thriving in other locations—among many other failings. If journalistic ethics and responsibility was in place, we might expect when it’s published (or even today, considering the availability of the working document), the Guardian and other media that headlined Sanchez-Bayo’s apocalyptic warnings will actually do some original reporting rather than just megaphoning press releases. Let’s not hold our breath. If they do their homework, they would cite a 2010 paper by Hambler and co-researcher Peter Henderson, one of the most thorough and painstaking studies of its kind. It estimated that the extinction rate of all species in Britain going back to the 19th century has been 1-5 percent per century. They also note that the vast majority of these extinctions took place before the period of agricultural intensification and modern pesticides that began, approximately, in the 1950s. There’s no doubt this ‘crisis study’ has served the authors’ apparent purpose in generating media alarm and arming environmental advocacy groups with a new apocalypse to sharpen their attacks on intensive farming and, especially, pesticides. 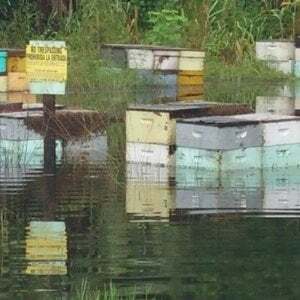 Before legislators and intimidated regulators spring into action, they should reflect on the faux bee-pocalypse crisis. Jon Entine is the executive director of the Genetic Literacy Project. Read his full bio here.